1. If you're dealing with persistent back discomfort, please don't wear heeled shoes (of any sort). Katy Bowman talks a lot (!) about this, but I also have noticed it consistently in my body. When I stop wearing heels, my knee pain and one sided back pain goes away. Easy as that. 2. Pay attention to how much you sit. You might sit for orchestra or teaching 5 hours a day, maybe you drive to work (1-2 hours), then you sit for dinner, sit to be on the computer, etc. We often don't sit in alignment, and car seating makes aligned seating virtually impossible. (Sports cars are especially slumpy and low to the ground, fyi). Check this out to see how much you actually sit. 3. Now notice how you sit. While there are many ways of thinking about sitting and gaining awareness, the simplest thing to look at is pelvic alignment. (i.e., are you tucking your pelvis and sitting on your sacrum? Or are you overcompensating and arching?) You possess two sitting bones (ischial tuberosities!) 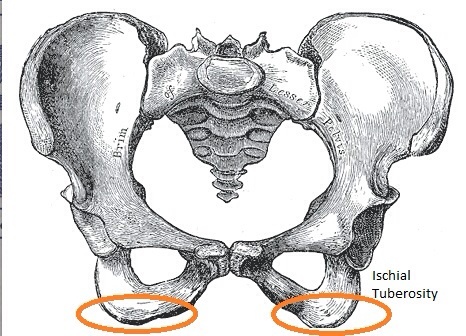 which are meant to be used in order to stack the spine over the pelvis. 4. How do you stand? Which hip do you favor? Do you hyperextend you knees? Do you wear heels? How is your pelvic tilt in standing? 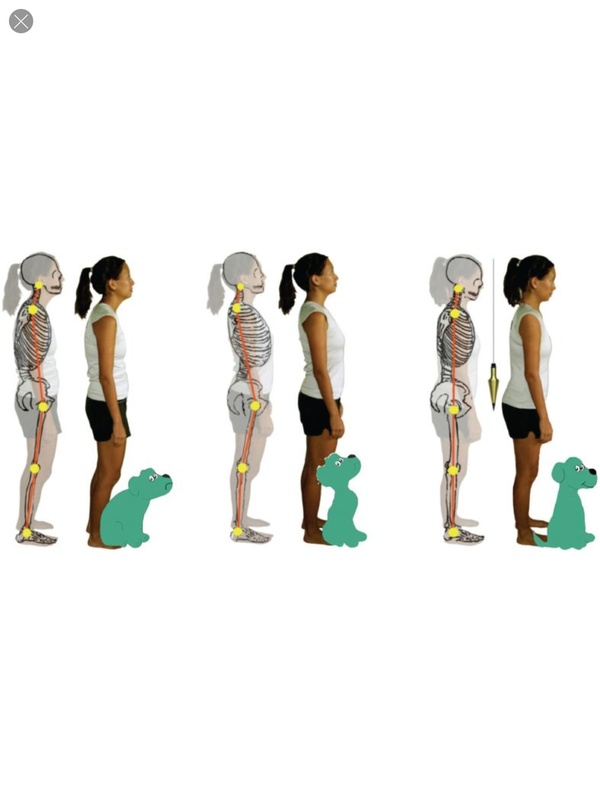 This image, from Sad Dog, Happy Dog, by Kathleen Porter, depicts some of the postural issues in standing. The person on the left is a pelvic tucker (or a sad dog), which leads to the slump in the upper body. 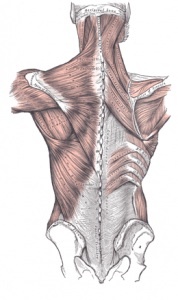 The person in the middle is an over-corrector (or a rib thruster), which jams the lower back vertebrae. The person in the right is more in alignment (a happy dog), at least by her criterion. (Many different movement, posture, and exercise modalities disagree on "ideal" alignment.) Even if everyone can't agree on the finished product, it's good to see the two typical patterns that folks usually fall into (sad dog and rib thruster). Also, notice how the first person juts their head forward-ouch! Many of us musicians do this ALL THE TIME while playing, and it's pretty terrible for our spines. That's a conversation for a different day. 5. Get moving. I don't necessarily mean high intensity short duration exercise, but just moving more. Walking, sitting on the floor, squatting, lunging...basic human movements that get neglected for our technologically savvy lifestyle. High intensity exercise can be damaging for your tissues, especially if you sit all day, because of the short duration and abrupt shifts in intensity from sedentary and slumpy to running/kickboxing/etc. Notice if your exercise or movement patterns are also in a rounded (sad dog!) position, like cycling, and start mixing it up more. 6. The spine moves in 6 directions. Side to side (lateral flexion and extension), twists in both directions, and then rounding (spinal flexion) and backbending (spinal extension). Even if you're not a yoga/stretching person, you want to integrate those spinal movements into your daily movement practice to maintain range of motion and disc health. Image courtesy of Cleveland Clinic. 8. Stop strengthening your rectus abdominus, and start working on your obliques. The muscles that create a wrapping or casing along your core are your obliques, and they are underappreciated in the scheme of fitness, although they are integral to holding up your body. Don't just look at the 6 pack, folks. This is my favorite oblique strengthener. 9. Roll it out. I know I've mentioned the whole rolling on balls thing a few times now, but it really makes a difference. One sided back pain? Roll it out. Get a massage, keep the tissue change by rolling out tight tissues daily. It's been a game changer for me, and when my back was still spasming 3-4 years ago, it was the quickest way for me to get relief. 10. Don't be afraid to seek help. Even if an allopathic professional can't help your pain, consider a movement professional, a rolfer, a walking/gait specialist, Alexander technique, Feldenkrais- these are all folks outside of the realm of allopathy, but who focus on the movement-compensation-dysfunction relationship. It's ok to see someone regularly for bodywork and alignment, because they will notice things that you aren't feeling and help you to change movement patterns that aren't working for you.